Sometimes, tough decisions need to be made. Decisions that involve our very being and the existence of Earth... Like who to eat with after Friday night hockey! Did you expect something more deep and meaningful? #firstworldproblems So my dilemma was whether to join Milhouse and Gadget Girl in some quick eats (not necessarily good eats either) and then a night of role-playing games or head Downtown with Miss Y for Izakaya. Let me see here... 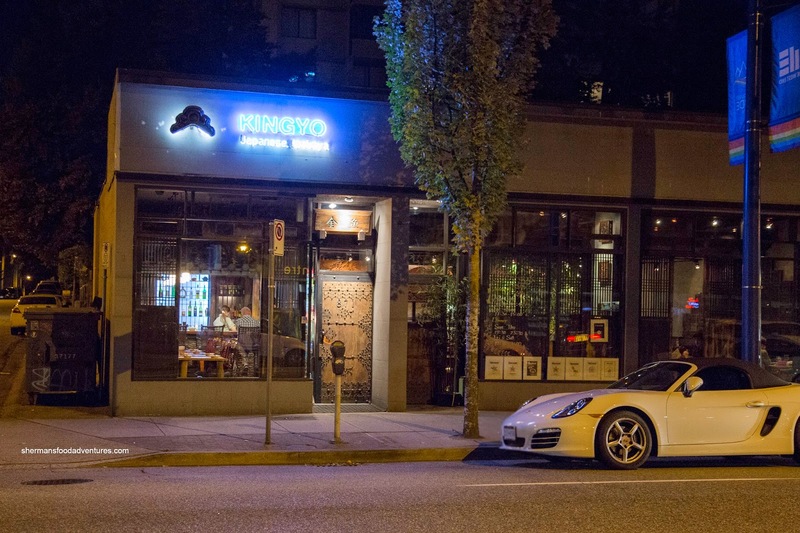 Unidentified eats vs. Kingyo with the gorgeous Miss Y... Guess who won? It was actually a great idea to visit Kingyo as I haven't been to the place in 5 years. 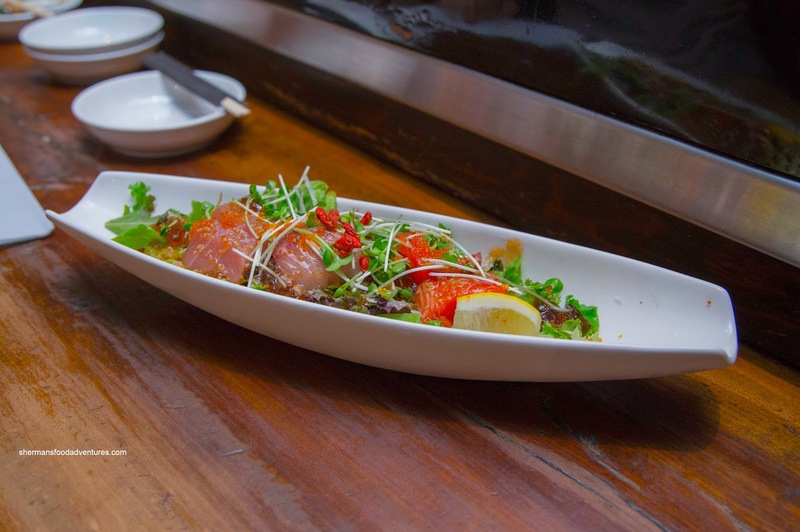 We started off with something light in the Fresh Sashimi Salad consisting of salmon, tuna and hamachi atop organic greens dressed with a soy vinaigrette and garlic oil. This was a pleasant dish with vibrant cuts of sashimi that had a nice sheen and a fresh taste (as best as flash frozen can get). I found the dressing to be plenty appetizing with a nice acidity that was balanced off by a savory sweetness. The pieces of ponzu jelly added another layer of salty tanginess. 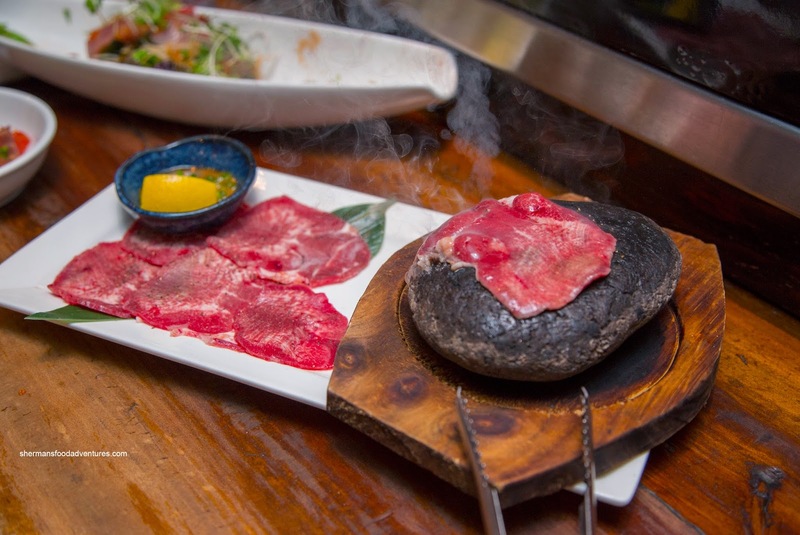 Next up was the Stone-Grilled Beef Tongue with yuzu red pepper paste. After nearly 7 years of offering it to Miss Y, she finally accepted my tongue! Woohoo! With a quick sear on the hot stone, each thin slice of tongue was predictably chewy (tongue is not tender unless you stew it). Tart and slightly aromatic, the paste was a mild compliment to the tongue. 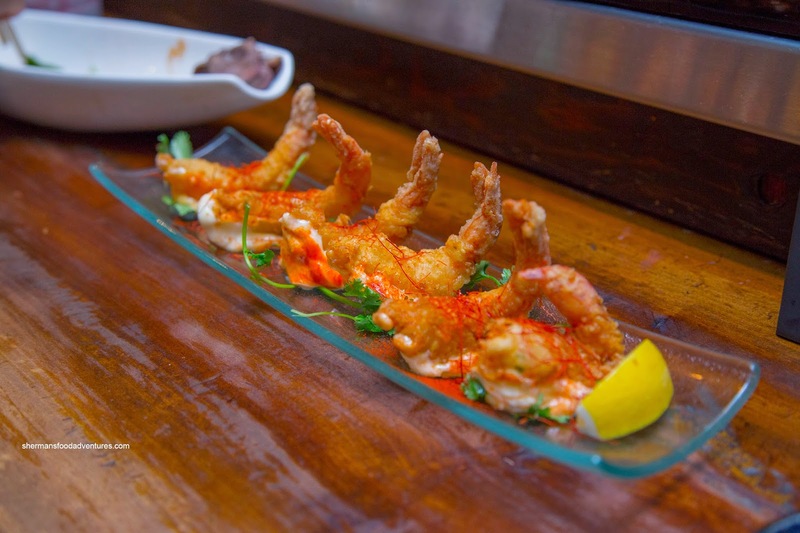 Onto one of my favourite Japanese dishes was the Ebi Mayo made of tempura-battered tiger prawns with spicy chili mayo. These were impressive too look at but we found the batter to be slightly too dense. Therefore, the crunch was rather firm and somewhat doughy inside. On the other hand, the prawns were large and had a meaty snap. As per the description, the mayo was spicy with a tang rather then the usual sweet version. 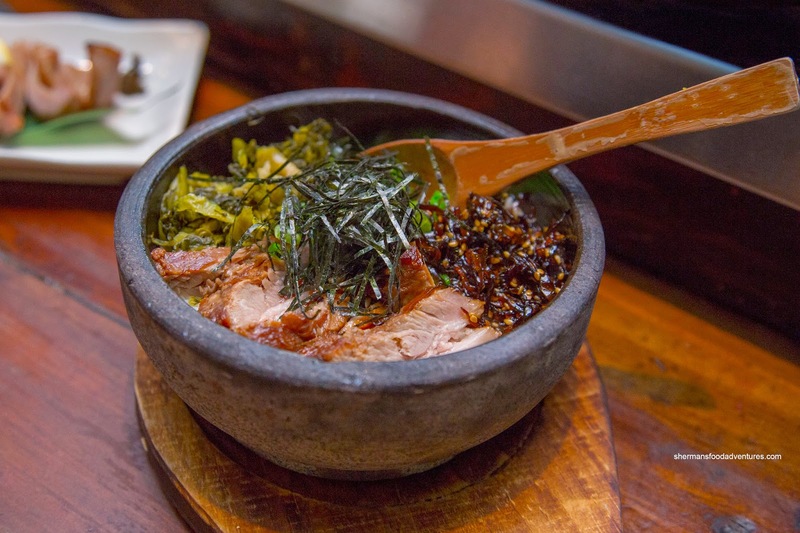 Moving onto a larger dish, we tried the Stone-Grilled "Kakuni Bibimbap" with slowly stewed tender pork belly "kakuni", Korean-style pickles, nori and green onions on Koshihikari rice in a sizzing stone bowl. This was a substantial amount of food, in particular, the pork belly (which was succulent and meaty with a beautiful roasted flavour). After a quick mix and then squashing the rice onto the sides of the bowl, we waited until a caramelized crust had formed. This was aided by the sweet sauce which was nicely accented by the crunchy and tangy pickles. The chewy short-grain rice held up well to the ingredients, which was key to this dish. 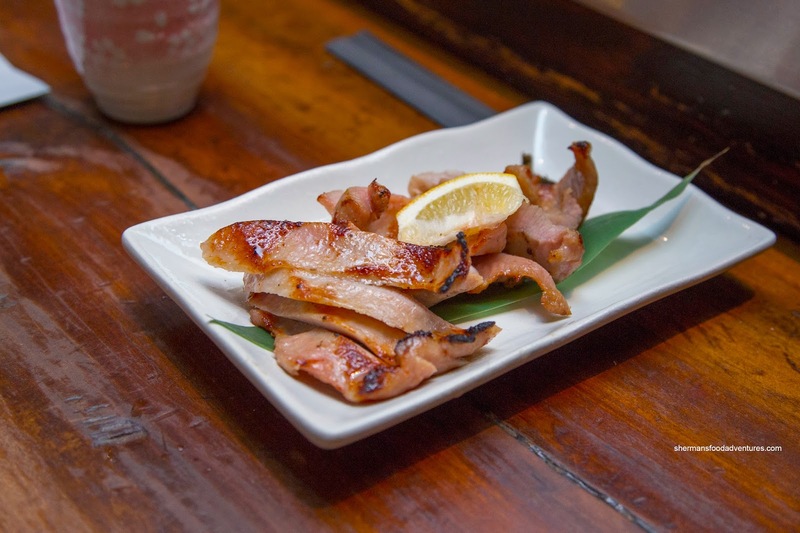 With Miss Y still chewing away on the one piece of tongue she agreed to eat, another plate of chewy meat arrived being the Grilled Pork Cheek marinated in Kingyo's original miso marinade with homemade blended spice on the side. Now when I said chewy, it wasn't in a negative manner. Pork cheek, similarly to tongue, needs to be braised in order for it to become tender. Simply grilled, it came out with a bouncy chew which was complimented by a nice exterior char. Tastewise, it was mildly salty and a touch sweet that was balanced out by the spicy condiment. The squeeze of lemon was key too as it lightened things up. 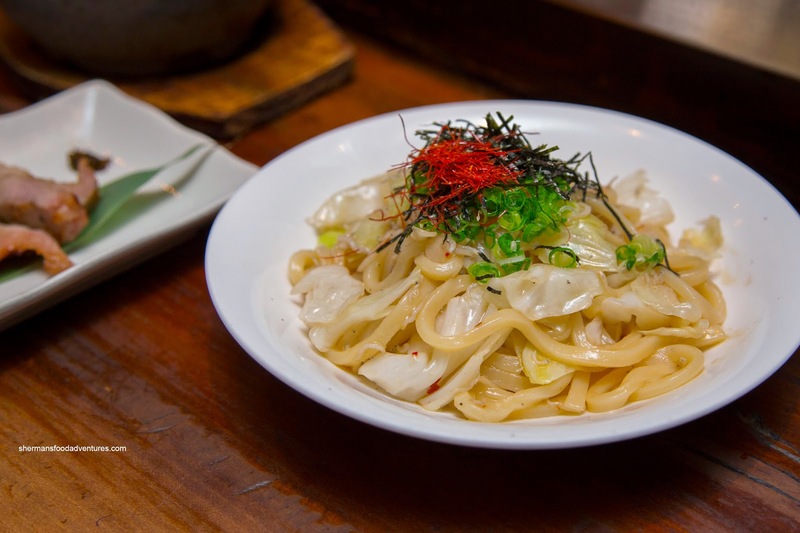 Miss Y loves udon, so it was a given we tried the Kingyo-Style Peperoncino with Japanese anchovy, cabbage, green onions, chili strings and nori. We found the dish to be rather salty due to the anchovies, but for me, it was just right. The noodles were still chewy while slightly wet from the cabbage. For dessert, we had the Blue Cheese Ice Cream with walnuts and apple compote. As much as we were warned that there was a considerable amount of blue cheese in the mix, it wasn't overpowering. 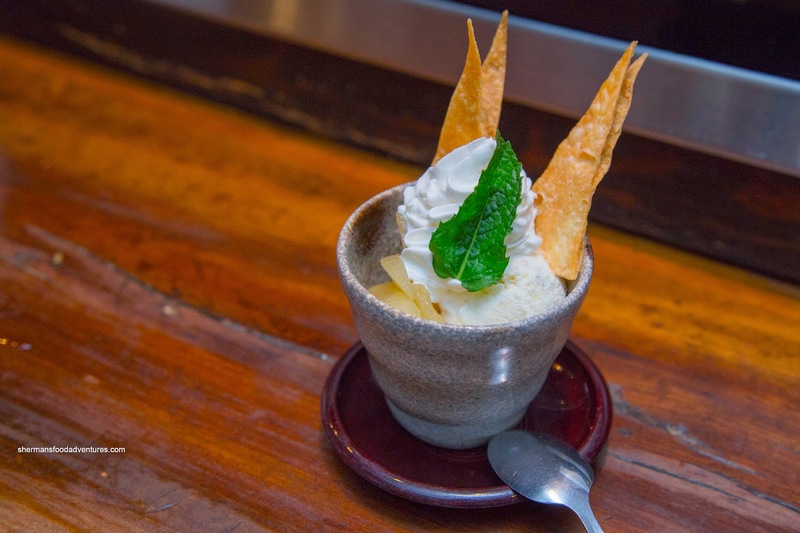 We liked the sharpness combined with the mild sweetness of the ice cream. The apples were tender and only slightly sweet while the walnuts added a nice crunch. After all this food, we were plenty satisfied and felt it was money well spent. Turns out Milhouse ended up suffering through a visit to Pho Hoa... I guess I made the right decision! Anyways, 5 years later and we still find that Kingyo continues to deliver good eats late into the night.